Letterpress is relief printing. 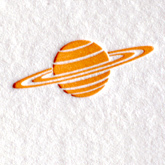 This means that a raised surface is inked and pressed into a sheet of paper. This raised surface can be metal type, wood type, a photoengraved plate made of copper, magnesium or photopolymer, a woodcut or wood engraving, or even a carved linoleum block. For most of our printing at Julie Holcomb Printers, we use steel-backed photopolymer plates. The relief is produced by exposing the plate material to ultraviolet light through a negative, and then washing it in a water bath. The unexposed areas then dissolve away, leaving the raised image of the art to be printed. When the plate is dried, it becomes very hard, holding fine details even over long runs. We can make plates from any computer-generated negative, or any art that can be clearly photographed or scanned. In the finest letterpress, the printed image is crisp and sharp, because a dense layer of ink is deposited only in the floor of the impression, leaving the walls of the impression clean. The rich texture of light and shadow created by these clean-walled impressions gives letterpress its unique beauty. The quality of the impression gives a feeling for the paper, just as a woodworker's skill reveals the character of fine wood. Well-printed lines sink into soft paper, giving a feeling of warmth, and an impression made in a hard, smooth paper will be shallower and seem almost carved. In every case, the impression in letterpress is not done for effect; it is a real artifact of the process. In a letterpress-printed piece, you can see the mark of its making, which conveys an authenticity absent from most of what we encounter in contemporary life. Letterpress printing is labor intensive, and printing really well is especially time-consuming and requires a great deal of skill. Years ago, letterpress was virtually abandoned in favor of faster and cheaper printing methods better suited to the mass market. But just as fine cuisine is still appreciated in a world of fast food, fine letterpress printing is still valued for a kind of beauty that can only be created by genuine craftsmen.